Planning your next event? Your attendees have a myriad of distractions in the palm of their hand. Smart meeting planners are getting more creative and discerning about what they put on stage. And You’ve Found an Industry Favorite! ​For over a decade, The Danger Committee has eliminated boredom, increased engagement and retention, and transformed corporate meetings with their customized comedy and daring visual antics. Their successful run on NBC’s America’s Got Talent sets a high bar of expectation and this trio from the Twin Cities exceeds it every single time. – Combined, they’ve worked with companies in over a dozen countries on three different continents. – One of their members has been recognized twice by the International Film and Video Awards for Outstanding Creative. – One of their members has moderated a panel discussion on Enterprise Risk Management that included advisors to the World Bank and the CFO in charge of the world’s largest corporate operating budget. – One of their members has been asked to introduce a United States President. – They have been contracted to facilitate multi-city training programs spanning several months. – They are consistently ranked as superior in post-conference feedback. – They have been invited to participate in ongoing innovation programs by multiple training companies and corporations. Want to make your event a success and your job easier in the process? It doesn't matter how great your content is if your audience isn't engaged. We know that our first job is to make sure that your audience is excited about what you are trying to accomplish and that your message lands. The Danger Committee will make your audience sit up and take notice while integrating customized content and information into everything they do. Looking to create a buzz around your trade show booth? Getting attention at a trade show can be tricky. Getting them to stop and engage, can be a monumental task. The Danger Committee knows how to draw a crowd, hold their attention and deliver your message in a way they won't soon forget. The Danger Committee will help you create an experience to bring in leads, and get people engaged with your booth. Are you considering a holiday or end of the year party for your company? Are you on this years planning committee? Bring them the very best! The Danger Committee will help you create an event that your audience will remember forever! Imagine a show that is hilarious, exciting and truly engaging. 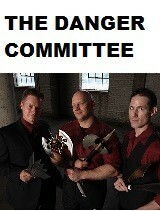 The Danger Committee will customize their show to perfectly fit your event!